The histories of an iconoclastic institution aren’t easy to trace. The New School has always been diffuse, porous and underfunded. Until recently, The New School didn’t even have an archive. So the fifty-seven volumes of publicity scrapbooks maintained by a clipping service for the school’s first several decades — and now available through the digital archives — are a precious trove. They provide real time reflections of what the always outward-facing New School was up to — and was seen to be up to. Every page reveals something unexpected. Consider an example. “Exiled Knowledge Salvaged for World Use: Europe’s Scholars Find Opportunity to Work and Serve” offers insight on many levels. The date and full name of the newspaper where this article appeared have been lost, but the article seems to be from the Wall Street Journal. It was published in 1943, ten years after the New School established the University in Exile — through which it helped rescue nearly two hundred scholars endangered by the rise of fascism in Europe and reshaped academic life in the United States. The photograph shows Hans Staudinger, one of the original eleven refugee scholars brought to the New School in 1933. The caption emphasizes that Staudinger was not a scholar but “once an important Prussian utilities executive” who served in the Weimar government. “Before he escaped to America he was badly beaten by storm troopers,” it concludes. With many of his colleagues, the article reports, Staudinger had assumed American citizenship; they “never expect to return to Europe, unless they are needed by their adopted country for special missions.” Such reassurances were needed to quell suspicions about the loyalties of the New School, especially during the war. 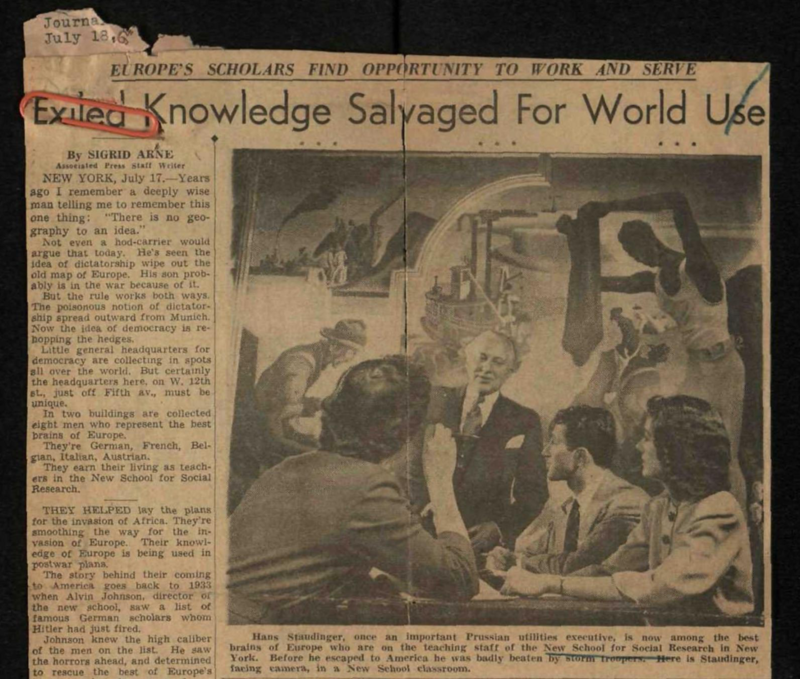 But Alvin Johnson, founder of the University in Exile, earnestly believed that world knowledge and scholarship had found a new home in America. Johnson saw the New School as a fulcrum of a new Renaissance, as when refugee scholars from the fall of Constantinople had found new lives in Italy. The caption tells us further that Staudinger is in “a New School classroom,” but this was not quite true. In the 1940s the Benton room was not, in fact, used much as a classroom but instead for prominent events and meetings. Newspaper readers may indeed have recognized the room, for this dramatically muralled space — excitingly unlike anyone’s picture of what a school should look like — appeared in many stories about the New School. 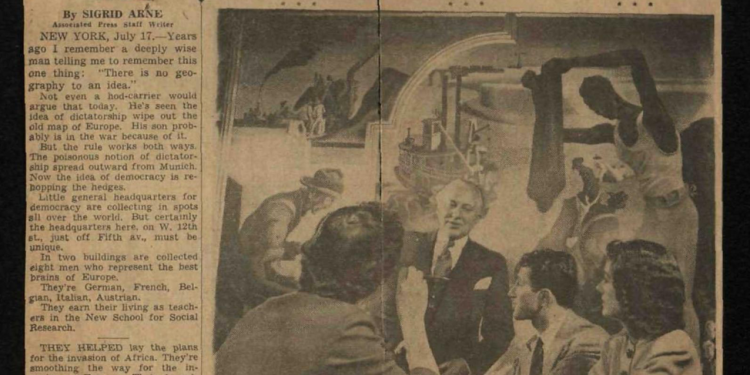 The mural itself is part of Thomas Hart Benton’s “America Today,” the more celebrated of two mural-wrapped rooms that could be found in the 66 West 12th Street building the New School opened in 1931. Benton’s murals left the New School in 1982 for reasons of preservation — and money — and have slipped from New School memory. Today they are on display in a dedicated room at the Metropolitan Museum of Art. The juxtaposition of the German Staudinger (who was not Jewish, although his wife was) and Benton’s America isn’t accidental. 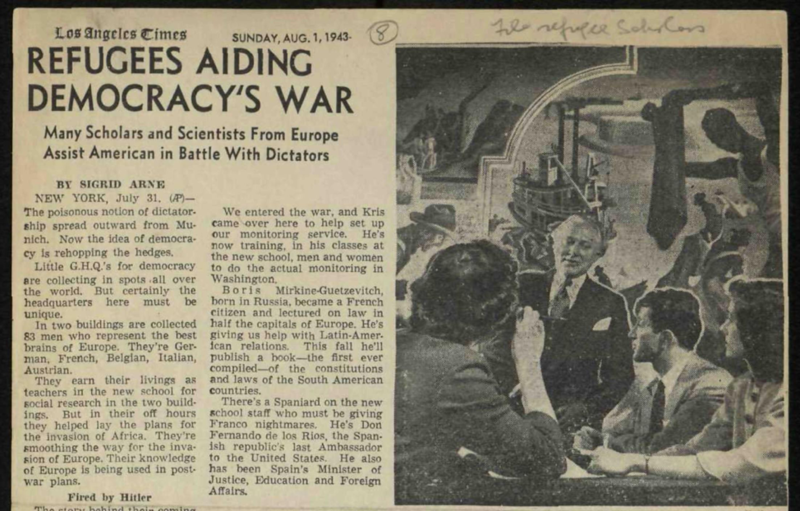 The very same image appeared in other publications, too, where it is clear that it is a composite of two photographs — in an image in the Los Angeles Times, you can see the stitching. It is a publicity image with a clear and exciting message. It tells of European scholars in a fully American scene, confronting specifically American legacies and challenges. Realize that the photograph was composed and you can recognize other parts of the image as intentional, too. Between Staudinger and the camera sit three students at a table, a representation of the intimate discussion-based pedagogy which had, from the start, been a hallmark of the New School. Two of the three students are women. If we don’t remark on this today, readers in the 1940s certainly would have likely noted it. As an institution which generally wasn’t awarding degrees, the New School had little reason to keep track of who its student were. But a self-study conducted in 1952 found that women had composed a steady two-thirds of the student body for the school’s first three decades. (The proportion was inverted in the graduate programs.) New School promotional publications from 1943 show women predominating, too. The presence of women was part of the nature of the place and was shown as such in its own promotional material. Like the Benton room, the New School’s long-standing female identity has been largely forgotten. The shortlist of “founders” changes with time but is always only men. Some note the novelty of the proposal for an “Independent School of Social Science for Men and Women” in our earliest document, and that “women in the modern social order” is listed among the “pressing problems” that called for a new kind of school. Yet few notice that more than half of the founding board were women — women who were decisive in shaping the distinctive structure and ethos of the school. That the school was effectively run for four decades by another woman, Clara Mayer, is even less known. The image attending “Exiled Knowledge Salvaged for World Use” invites us to a school we’ve forgotten we are. A key node in an international community of knowledge, the New School was rooted in American traditions as it addressed American and global problems. Energized by the power of modern art to illuminate social change, it was a cosmopolitan community of engaged teachers and adult students, most of them women. What would it mean to recover this memory? This Public Seminar vertical is a place within which a fuller portrait of the histories of the New School can unfold. It will defamiliarize the school, as the best history always does. It will also make the New School’s complicated and often conflicting legacies available in a new way for thinking about the construction of knowledge, the aims of education, and institutionalization of higher education. Issues in the representation and self-understanding of the history of institutions — like the persistent effacement of women from New School narratives — have broader resonance, too, especially for communities that risk making an idol of the new. The new, to put it a little broadly, is always a proposed future remedy for a perceived past infelicity. As successive contributions to this vertical will show, every moment of novelty, whether visionary or trivial, has something like the stitched-together structure of this image of “exiled knowledge salvaged for world use.” The Benton mural in the background and the women and men in the foreground establish the precarious space where the new can be truly transformative. 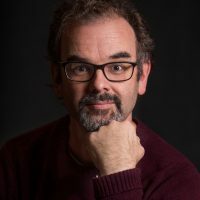 Can There Be Dignity In A Vast Majority?